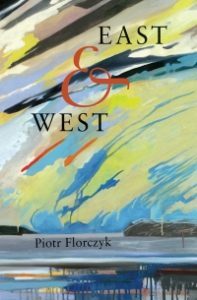 Piotr Florczyk’s childhood in Poland, and adult years in the United States, create a poetry in East & West that reflects just such a worldview. In this lyrical book of poems, Florczyk turns an eye to the Berlin Wall, kitchen utensils, swimming at night, a weightlifter, and a telephone museum, to name a few. Florczyk examines each of his subjects with careful attention and offers us observations served up with not only precision to the fine points of the subject, but also often with a wry look. ‘Don’t ever call me again. The progression of the telephone is evidenced by a “cordless / push-button freedom fighter,” and as “technology goose-steps by,” we are standing on the sidelines, amazed, able to only utter “oohs and aahs.” The implication is that not only is technology moving, but so is history, and we must wonder at our own inability to have a say in its march forward. The poem aptly gives us a message, but it is also meant to make us smile. Some of them too, share a rather human relationship: “The peeler / loves the grater the way / the heirloom tea cup loves the saucer.” And beauty may be found here in a carafe of icy water as it reflects sunlight onto the china of “mortals.” Florczyk ends the poem whimsically, making us feel fortunate to have such deities among us. More serious observations of American life, particularly the life of the suburb, find their way into the volume in an ecopoetic lyric. A narrator’s first backyard becomes the subject of a hymn of the modern day community, with everything present in the lawn from trash to animal life: “everyone I know is already here, or waiting / in line to get in. Ants, spiders, earthworms, even a pair of field mice / with BB gunshot wounds who show up at dusk. Same as newlyweds, / they bring suitcases full of sticks, tin foil scraps, dead flies.” “May’s beautiful here,” the poet writes of the backyard, full of the ground cover pachysandra and “fenced in by tall weeds.” Creatures, “you gypsies of the soil,” are summoned to climb over his feet, and, here, Florczyk, in union with his parcel of nature, delivers traces of Whitman. East & West is, finally, a plunge into the American experience framed by the past of a poet who well knows another culture. Florczyk, time after time, packs his poetry with the details of the world that he sees around him and it is through this plunge into phenomena that we see our own lives through a fresh lens. And Florczyk’s philosophy through these pages seems to say that the world is with us, moment by moment, relaying bits of insight into our existence. Jane Frazier is a Professor of English at Lincoln University of Missouri and has published a critical book on the poet W. S. Merwin, entitled From Origin to Ecology: Nature and the Poetry of W. S. Merwin (Associated University Presses). She is also a regular contributor to the W. S. Merwin website, Merwin Studies, and has previously published book reviews for The Literary Review.